citizenM is enabling its hotels to meet guests’ changing expectations. From multifunctional lobbies to seamless check-in, hotel brands are constantly striving to meet guests’ changing expectations. We sat down with Menno Hilberts, from citizenM hotels, to find out how the company is rising to the challenge. 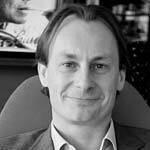 Menno Hilberts is Managing Director of Development, USA, for citizenM hotels. How can you make the guest experience a more human experience? The guest room is pretty okay the way it is, but we’re seeing quite a dramatic shift in the way our lobbies are working. We’re seeing much more flexible, interactive use of what is traditionally a hotel lobby. It’s breakfast space in the morning, it’s lunch space in the afternoon, it’s coworking space — people are working in their hotel of choice, because as an urban nomad, you pick places you feel are appropriate to have meetings or send emails or relax and have a drink. We’re seeing big transformation in the public areas, especially in the front of house. In the future, that will expand rapidly. Gone are the times when you could afford to have a dead hotel lobby that’s empty for the rest of the day; it needs to be vibrant all the time. We’re looking at opportunities to cross the boundaries between meeting spaces and bar. The hotel is much more flexible than it used to be. When you enter a market, what do you want to bring to your guests? We have a talented group of developers who travel a lot and live these cities. We do a tremendous amount of research, and find out where exactly the beating heart of a city is. Where does the urban nomad hang out? That’s where we want to be. We follow the people. We look at where the new restaurants are, where sports venues will be, and how crowds move. Location is often more important than the actual product. When you’ve really advanced, you can be the destination. Eataly, for example, is a great experience generator. Wherever they move into, that place becomes a destination. That’s magic. If you can sprinkle your brand on a property and make it instantly successful, that’s the holy grail. How is technology shaping the guest experience? Technology is a big enabler in streamlining the whole experience. If you buy something on Amazon, it’s a click of a button, yet if you check in a hotel, people still want to make copies of your ID. It should be seamless and integrated. For us, technology is basic infrastructure. There shouldn’t be any hurdles. You don’t expect to go into a hotel and not have the functionality you have at home. It should exceed that. We’ll see further integration between office, residential, and hospitality — asset classes that in my view are outdated. These boundaries will blur quickly, because urban users demand a seamless experience between where they work, live, and travel; it should all be part of one ecosystem. Airbnb is blurring the boundaries between residential and hospitality. Hotel developers and owners need to respond and include long-stay, short-stay, or flexible-stay options. Coworking should also integrate more into the hotel offering. Exciting times ahead.